I would still like to have a single page for all of the activity to make it easier to have larger 'like' count. Is there any way to achieve the above or do I need to create two separate pages? On your page go to Edit Page » Edit Settings. In the Manage Permissions tab ensure that Post privacy gating is checked and click Save Changes. 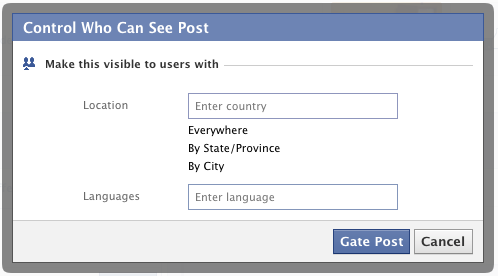 This will allow you to restrict posts to specific regions or languages. When you post, click on Public and then Location/Language, set the location or language that you want for that post, and press Gate Post. Only those in that region or with that language setting will be able to see the post. An alternative is to target your post by language, location, or other criteria. The difference between gating and targeting is that targeting still allows others outside of the targeting criteria to see the post, for example if they visit the page directly or if one of their friends from a different region likes it or comments on it. Gating hides the post completely from those outside the gating criteria. Facebook Page Events - Invite fans? How can I create a Facebook fan page that displays content only after user joins it? How can you remove a Facebook “Community” Page?